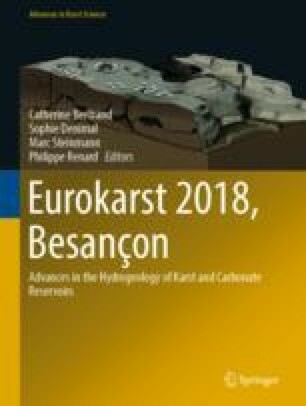 In this paper, we present the results of a characterization study of the hydraulic behavior of the Maastrichtian karst system of the Dyr perched syncline that is situated in the northern of the Algerian territory and constitutes the north horst of the Tebessa—Morsott subsidence basin. We applied the method of analysis of the flow recession curves of the main outlet, with particular reference to the decreasing part of the unitarian hydrogram. Therefore, we will analyze: the recession, during which the infiltration influences the draining of the reservoir, and drying up, which starts at the moment when the infiltration discharge becomes zero. According to the Maillet model, the drainage of the saturated karst sub-system will be described and the various physical and structural parameters of its flow will be determined. The application of this method on the flood hydrograms of the Ain Zerga spring, over a period of nine hydrological cycles (2002/2003 to 2010/2011), revealed us that this karst system is characterized by a very complex structure and hydraulic behavior. This complexity is certainly due to the hierarchy of voids and the considerable irregularity of the temporal distribution of water inflow from precipitation. The functioning of the system is always marked by slow infiltration, despite the irregular change of the climatic conditions. The duration of water infiltration for recharging the saturated zone is 6–12 days. The saturated zone is characterized by rather rapid draining, probably due to strong karstification. Its groundwater reserves are quite important, and its flow regime is influenced by losses upstream of the main outlet and the intensity of pumping in deep wells installed in this sub-system. According to the Mangin’s classification, the Maastrichtian aquifer system of Dyr is effectively a karst aquifer (K < 0.5) with a complex internal structure. At the end this work, we thank the leader of sector of the national agency of hydraulic resources of Tebessa as well as all the technicians and observers for their contributions in the realization of this study. We would like to thank the anonymous reviewers and the editor for their constructive criticism and suggestions.